Purl Soho teamed up with our friends Egg Press to create the Embroidery Kit of our dreams! Four designs depict a year in the life of a tree, from serene winter and bubbly spring to verdant summer and resplendent autumn. We also celebrate the simple beauty of a tree's texture with designs for 26 letters, 10 numerals, and a square, all in a lovely woodgrain pattern. Please click Product Details, above, for a complete list of the Kit's contents. 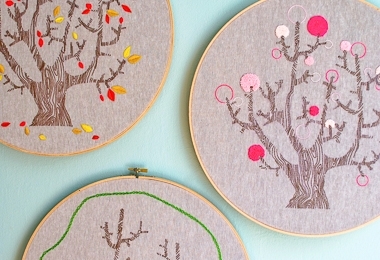 The finished trees are pictured in a 14-inch embroidery hoop.